I took this photo a few years ago in Yellowstone National Park. Every time I visit the park I see several animals with radio collars. 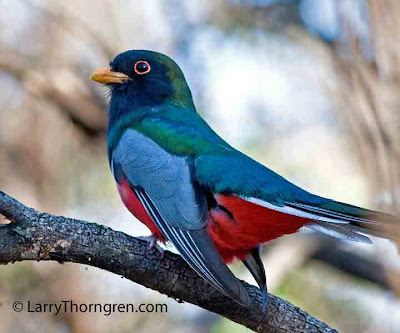 Many wildlife biologists seem to think that wild animals are their own special research objects. They often abuse or kill wild animals in their quest to mico-manage the animals for information that is often only used to write a graduate thesis for the biologist's self promotion. This bear had to be darted and drugged by a researcher to get this collar on. The darts inject the drug with an explosive charge as it strikes the bear and often drives dirt, hair and other material deep into the wound which causes infection. Two Grizzlies died of infection from dart wounds in the Yellowstone area last year. 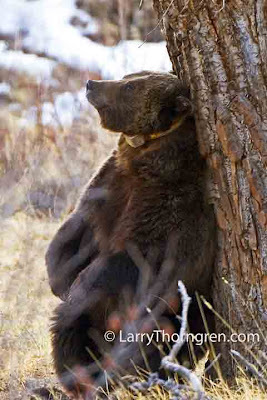 This Grizzly was doing his best to set himself free from the collar. Collars provide hiding places for ticks and mites and cause severe itching. I saw and photographed a Grizzly Bear in the same area a few weeks later without a collar. I hope it was this one and that it succeeded in scraping off the collar. 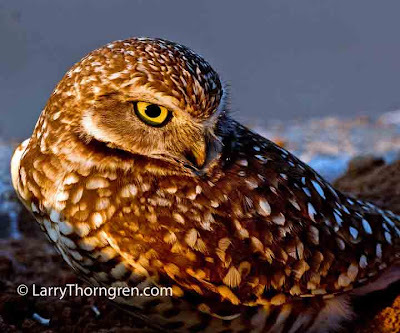 I found this Burrowing Owl along an irrigation ditch in California. It was near an artificial burrow consisting of a pipe extending underground to a plastic Box. I usually photograph Burrowing Owls here in Idaho and in some places biologists have placed similar artificial burrows which the owls use to raise their young. These owls often have large families and may raise up to ten babies a season. 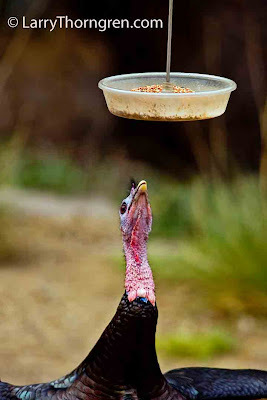 Generally when birds or mammals have large numbers of young, it means that they are subject to many hazards in life, and they compensate by producing many offspring. 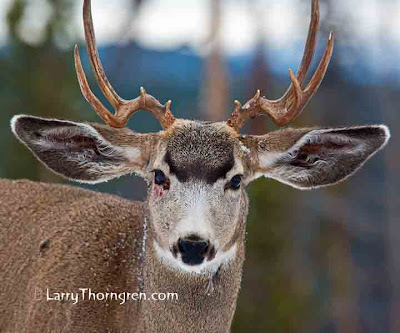 Mule deer gather in November for the mating season. 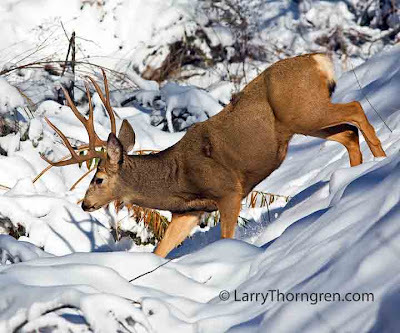 Large bucks like this one come to find females and are more easily approached than at other times of the year. They are dangerous at this time and I have seen them severely injure each other during mating battles. The Fish and Wildlife Service will be making a decision in the next few weeks about placing these birds on the endangered species list. 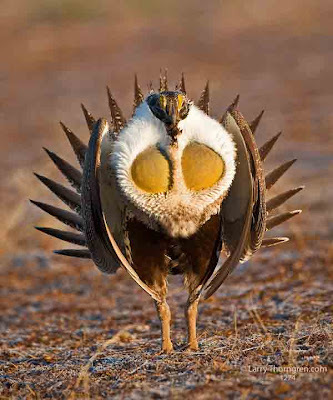 Sage Grouse need large tracts of sage brush in order to thrive. Overgrazing by domestic livestock and the relentless growth of human populations steadily reduce areas that are suitable for them to survive.I photographed this male grouse on a a strutting ground called a Lek. 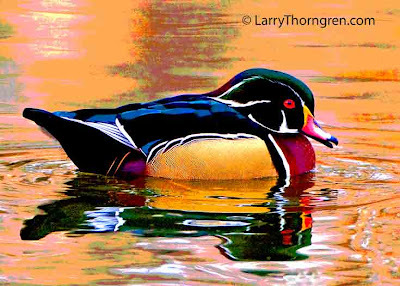 The males assemble each spring and strut and display on the Lek for about two months to attract the females who come a few at a time to pick a male as a mate. The male inflates the large yellow sacs on each side of his neck, throws his head forward and releases the air in a loud plopping noise that can be heard for some distance. I set my blind up the night before and got into it while it was dark in the early morning. 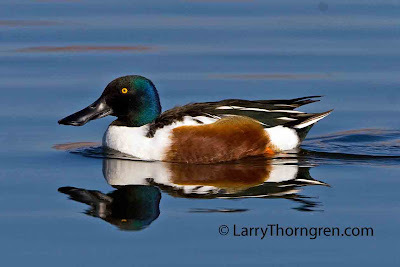 The males payed no attention to the blind and came close enough to brush their wings on the side of it. 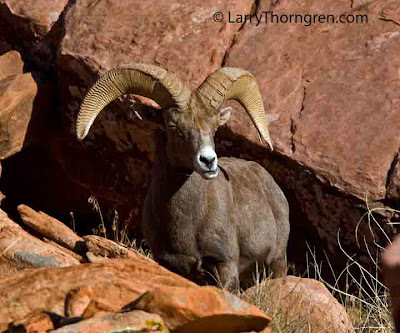 One of my pet peeves is going to Yellowstone and aiming my camera at a "Wild" animal and finding that it is part of some intrusive research project. 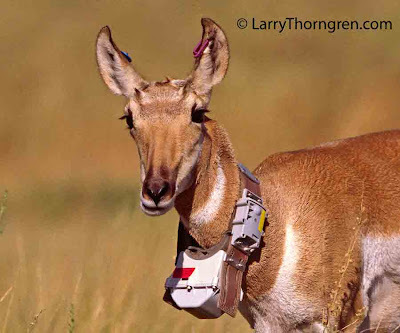 At one time over 100 Yellowstone coyotes were treated like little clowns and equipped with these radio- collars and tags. (The coyotes were trapped using leg hold traps, that should never be used in National Parks) Park research rules requiring the removal of these collars at the end of the research project were ignored and the coyotes were sentenced to wear these non-functioning radio- collars and ear tags until they die. Yellowstone is supposed to be a place where animals are wild and free. 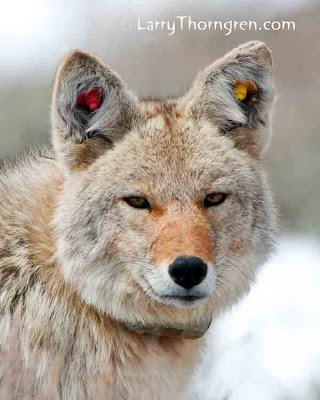 Some how this coyote looks non- wild, domesticated, and abused. Labels: Coyote, ear tags, Radio Collars, Yellowstone. 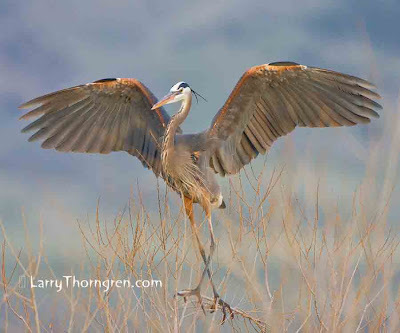 Great Blue Herons are shy birds that nest in colonies. 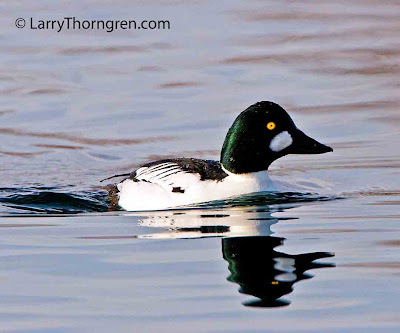 The colonies here in Idaho may have just a few nests or may number in the hundreds. I found a small colony of herons along a reservoir in Idaho, where I could set up a blind and photograph them as they landed near their nests. This bird is just coming into a landing. He has his legs crossed and is attempting to figure out how to uncross them. 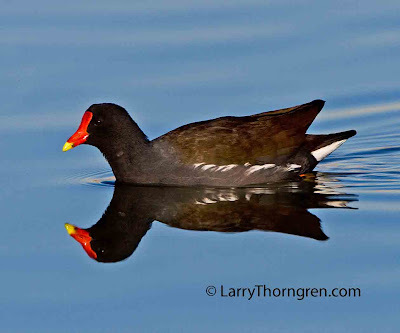 I watched several of these birds last week and finally one swam close enough for me to get this photo. I know very little about them, but after watching them eat duck poop every day I wouldn't want to eat one. I wonder if that bright red forehead is a warning that says I taste like s--t.
This fledgling Great Gray Owl has just been handed a meadow vole by its' mother. It is getting ready to swallow the vole in one gulp. I found this young owl with its' mother and two siblings about 3 miles from my home this past summer and returned two or three days to photograph them before they moved on to find more voles. 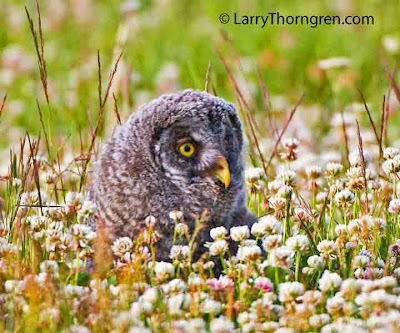 Great Gray Owls will feed their young all summer and into the winter. The young give a loud screetch when they see their parents with a rodent. 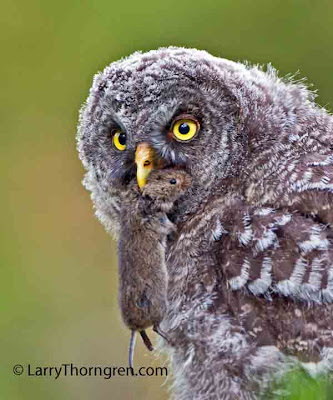 As they get older, young owls will fly to the parent with vole or mouse and attempt to take it away. The parents are adept at dodging the aggressive owlet and giving it to whichever baby owl they please. I spent the morning watching an Osprey circle over head this morning, but it didn't see any fish to dive and catch. 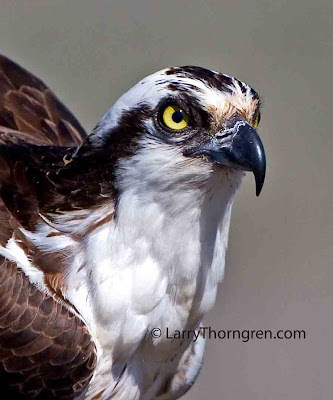 I am posting a photo of an Osprey from Idaho that I took less than 1/2 mile from where I live. They nest on power poles along the roads and this one was sitting on a fence post while his mate incubated the eggs in the nest. It is cloudy and gray again here in Nevada, so I am looking at some older files. 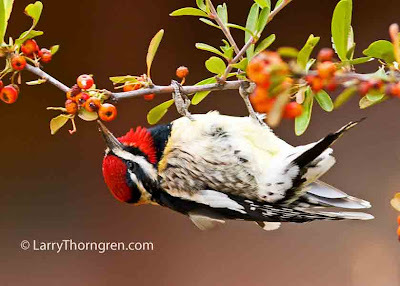 I was pleasantly surprised when I found this photo of a Red-Naped Sapsucker that I took last spring in Arizona. It was upside down eating berries instead of sucking sap, but it made for a nice photo. 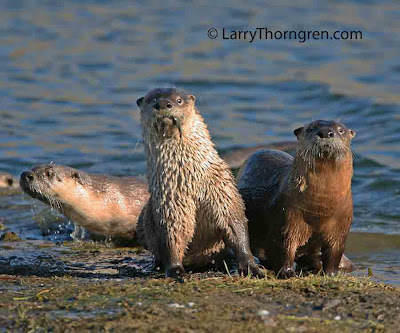 When these river otters came out on land to play and mark their territory, they found a coyote snooping around. They quickly rushed him and chased him away. 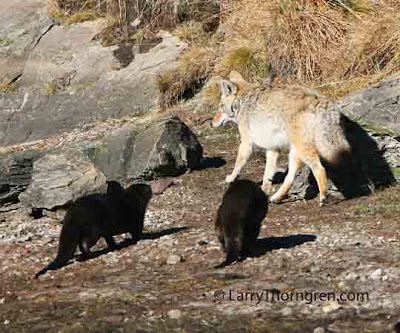 The coyote did not seem to be inclined to argue with them. This activity took place along the Yellowstone River in Yellowstone National Park. I enjoy playing with my photos on my computer. (It is raining today in Nevada where I have my travel trailer) If you take an excellent photo, add some saturation and then posterize it, you can get these fantastic images that are better than paintings. 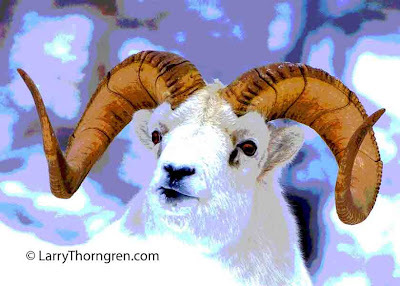 This is a photo of a Dall Sheep Ram I took along the Alaskan Highway in the Yukon a few years ago. These are beautiful sheep without posterization. The cormorants at the fishing pond in Veteran's Memorial Park in Boulder City can always be counted on to put on a show catching planted fish. 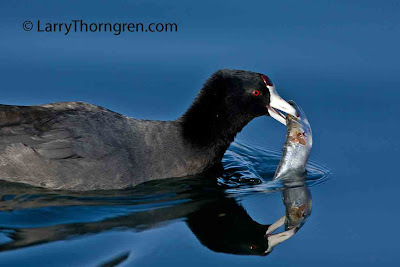 The fishermen hate these birds, but I find them quite interesting . 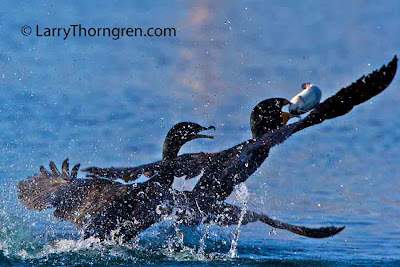 While I sympathize with the fishermen, I am interested in photographing the cormorants in different poses. Each catch is different from all the others. This one shot high out of the water with its' trout. 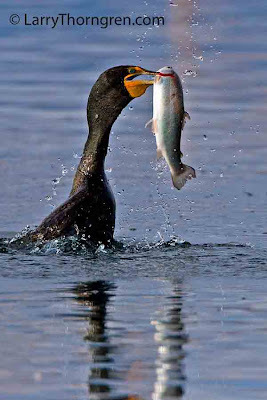 The cormorant chases the fish with its' wings tight against its' body, propelled by its' rapidly moving webbed feet. They can obviously swim faster that a trout. Occasionally they chase the trout close enough to me that I can see them swimming under water. Every hundred years or so a photographer gets to take a photo like this. 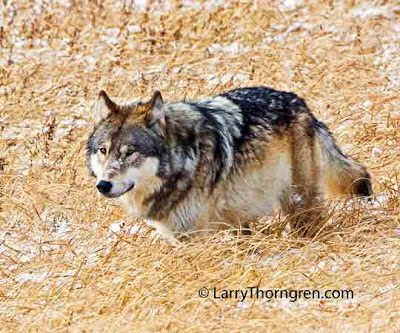 I found nine wolves howling next to the road in Yellowstone two years ago and captured this image of the dominant alpha female. The only problem is that someone else found her first and stuck this ugly radio collar on her. Wolves were re-introduced in Yellowstone 15 years ago and the park biologists have about half of them equipped with collars. 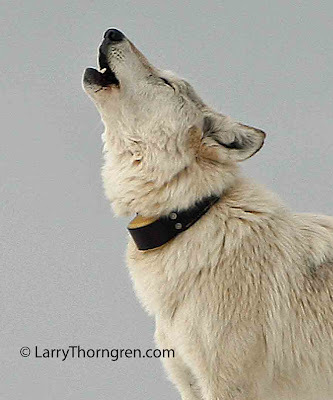 These collars do not magically appear on the wolves. They are put on the wolves after biologists chase them to exhaustion with helicopters and dart them with dangerous drugs. After 15 years, this study is more about setting records for the length of the study than in gathering any useful information. After recording thousands of so called "raised-leg urinations", studies like this become abusive when continued without end. I often see wild animals who have been captured and equipped with radio collars. With the technological explosion, wildlife biologists have rushed to put these intrusive devices on thousands of animals world-wide. I photographed this Pronghorn on a federal national wildlife refuge (The National Bison Range in Montana) several years ago. The red tag on the collar says University of Idaho. I took my eight year old Grandson to Dagger Falls on the Middle Fork of the Salmon River in Idaho summer before last. We found a colony of Pikas near the campground and my grandson found he could imitate the calls of the Pikas. This one came close and started scolding him in Pika language. I don't know what he thought my grandson had said, but it really seemed to upset the Pika. 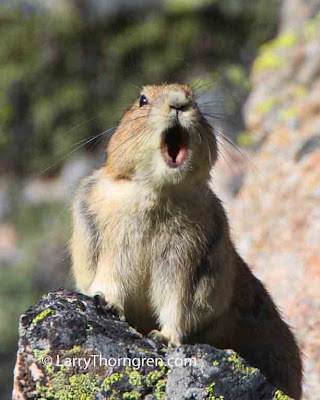 The Obama Administration refused to list the Pika as endangered today. These birds seem very ancient when I watch them. I wonder if they were around when there were Dinosaurs on earth. 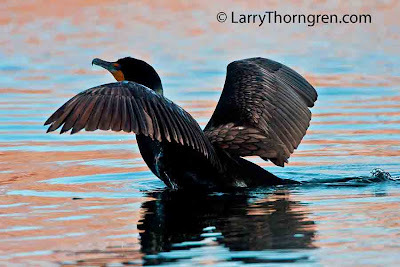 I caught this Cormorant just as it started to leave the water and fly. Weasels are fierce predators. While voles and mice make up most of their diets, they can and will kill rabbits several times larger than themselves. This one has just killed a vole and is taking it to eat or to stash it for future use. Yellowstone. Canon 5D, 300 mm lens. Labels: Long- Tailed Weasel, Meadow Vole, Yellowstone. 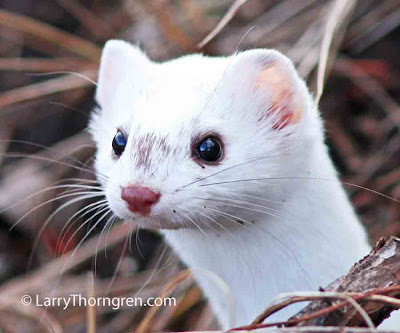 This weasel was incredibly curious and would pop up very close at times. He was attracted to the noise I made by scratching my fingernails on my jeans. They move so quickly, that it is difficult to focus on them before they move. 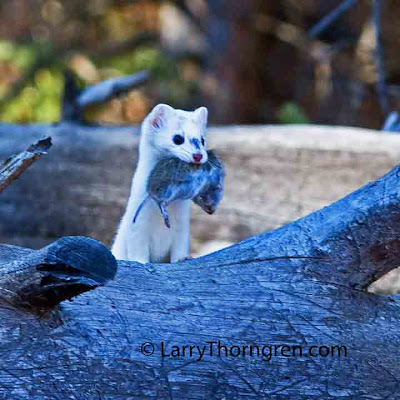 This weasel and the one in the post above were found in the same patch of timber this past fall in Yellowstone.. This one is larger in size and has a smaller dark patch on its' nose than the one with the vole. Lamar Valley, Yellowstone, Canon 5D, 300 mm lens. 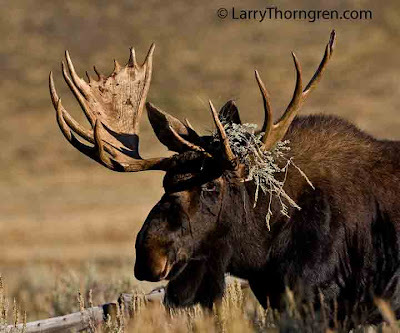 This large Bull Moose has been ripping up sagebrush and some of it stuck to his horn. Male members of the deer family, like this moose, rub their horns on tree branches and shrubs during the rut. They are dangerous at this time and may charge humans who venture too close. Grand Teton National Park, Wyoming. Canon 5D, 300 mm lens.